A file picture of a graveyard in disarray. 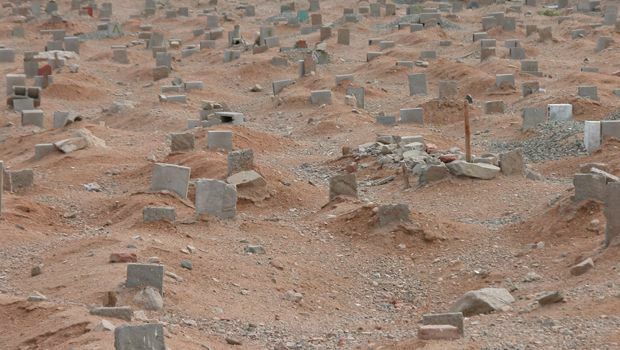 The National Society for Human Rights (NSHR) has urged municipal authorities in Makkah to take urgent steps to protect the sanctity of some graveyards that it says are being slowly ruined in the holy city, Al-Madinah newspaper reported on Thursday. Muhammad Al-Sahli, a member of the NSHR office in Makkah, has alleged that there are some serious lapses in safeguarding the sanctity of graveyards in the holy city. “A specialist committee commissioned by our office recently visited the graveyard in Hindawiya after receiving several complaints from citizens that it had been turned into a garbage dump and that there was a pool of sewage there,” he said, adding that the committee’s findings have vindicated some of the complaints. Some graveyards in Makkah, especially those on the outskirts of the city, have reportedly been turned into havens for stray animals and dumping areas for garbage and construction debris. These included Al-Nasiriyah graveyard, located in Al-Faihaa, and Hindawiya, whose wall has almost collapsed. Some workshop owners have turned three graveyards in Al-Mansour district into yards to keep their maintenance equipment, according to citizens. Fawzi Al-Sayyid, a local citizen, said Al-Nasiriyah is one of the oldest graveyards in the holy city located adjacent to Al-Faihaa Road linking Jomoom with the holy city. “Earlier, a philanthropist had erected a sign board alerting passersby about the graveyard and later one citizen placed barbed wire around it. But over the course of time, vehicles started passing through it and now most pedestrians are unaware about the existence of any graveyard there,” Al-Sayyid said. Muhammad Al-Sobhi, a resident of Hindawiya, said the state of the local graveyard, one of the oldest in the holy city, is the best example of the municipality’s negligence. “This prompted us to lodge a complaint with the NSHR’s Makkah office. As a result, the municipality started constructing compound walls around it. However, the project was halted before completion and we don’t know why,” he said. 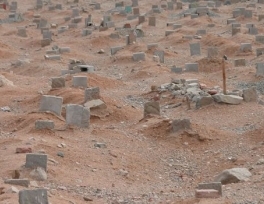 Ahmad Muhammad Barnawi, resident of Al-Mansour district, said the three local graveyards receive no attention and care from the municipal authorities. “Some automobile workshop workers started working close to the graveyard and they used to place some of their equipment and tools inside, especially during the peak Haj season,” Barnawi said, urging the municipal authorities to intensify inspections and stop violations. Ahmad Banani, a professor at Umm Al-Qura University, underlined the importance of maintaining the sanctity of graveyards. He quoted a number of sayings of the Prophet (peace be upon him) with regard to respecting the dead. Meanwhile, Sahl Malaibari, spokesman of the services department at the Makkah municipality, said the construction of a wall around Hindawiya graveyard was under way. “We don’t know anything about a graveyard in Al-Nasiriyah, and hence there is no question of constructing any walls there. If local residents know about the existence of such a graveyard, let them inform municipality,” he said, warning that stringent punitive measures would be taken against anyone involved in the desecration of graveyards.